On August 24, 2013, during the austral winter, Argentinean Natalia Martinez and Chilean Camilo Rada made the first winter ascent, by a new route, of a Patagonian peak with a history that's been shrouded in mystery since the misreported first ascent of its western summit 27 years ago. 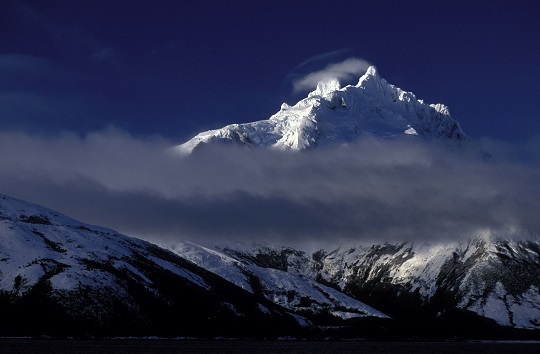 Ralf Gantzhorn, whose 2010 north-face ascent resurrected the decades-old confusion, wrote in Alpinist 32, "Far to the South, below the Straight of Magellan, in Tierra del Fuego, stands a mountain obscured by clouds and battered by storms. It rarely allows even a glimpse. But the few who have seen cannot forget, and they always return to Monte Sarmiento, the White Mountain of the Land of Fire." In autumn 2010, Gantzhorn, Joern Heller and Robert Jasper summited the shorter west peak (ca. 2100m) via the north face, believing they were the first to summit that face, only later discovering record of a 1986 first ascent. The 1988 American Alpine Journal reported the first ascent of the mountain's west peak via the west buttress on December 8, 1986, by four Italian climbers, but then corrected the report seven years later. The correction renamed all of the climbers on that first expedition, added two more (making the total ascent party six instead of four) and changed the line of ascent from the west buttress to the north face. Alpinist contacted Salvatore Panzeri, a member of the 1986 party, for clarification. He refuted the summit date and the party number, explaining that a team of five climbers achieved the west summit of Sarmiento on December 24, 1986 via the north face, nearly two weeks after the date reported originally in the AAJ. Luckily for this reporter, the climbing history of the east summit (ca. 2200m) is more straightforward. Carlo Mauri and Clemente Maffei followed the southwest face to the apex in March 1956. 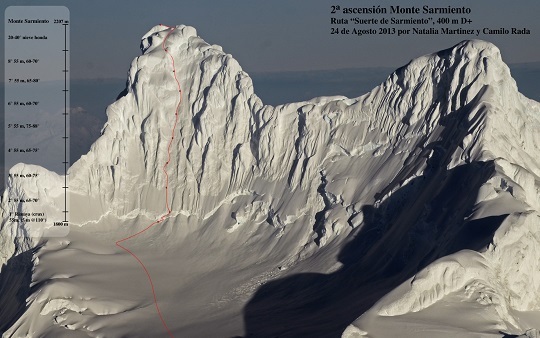 Martinez and Rada's recent new route on Sarmiento's north face marks that summit's second ascent, though it's seen numerous attempts. Of the climb, Rada writes, "It was in fact a wonderful experience, and we are extremely happy with the route chosen as it turned out to be a beautiful line to the summit and easier than we thought. I don't know if I would have been so happy on that wall in a hot summer day with all those ice mushrooms hanging over us." In order to reach Sarmiento, 150 kilometers away from the nearest town, the climbers took to the sea aboard the sailboat Arco Iris. Writing about the crossing, Rada said, "The weather is as bad as summer, but on average less windy. But fierce wind storms also happen in winter." With smaller probability of wet and cold conditions, the crossing was uneventful. 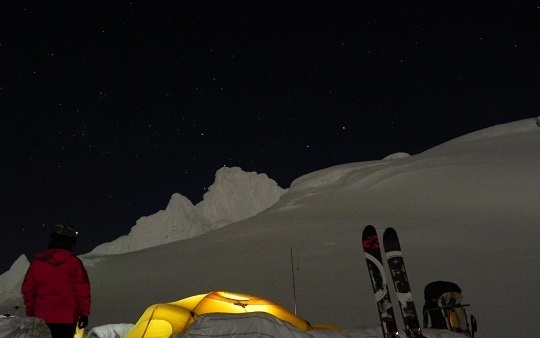 Martinez and Rada started from Conway Glacier and traversed the high plateau on skis. 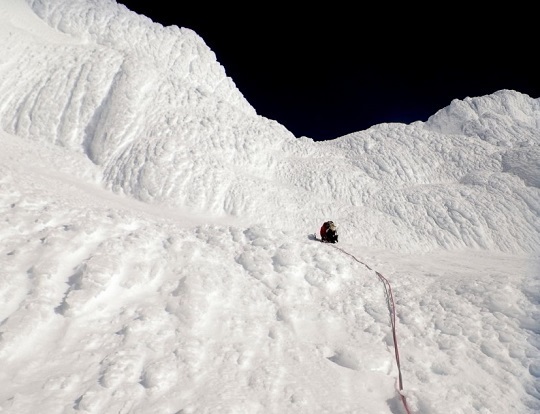 They planned to reach the east summit by a direct route up the center of the north face. The climbers found their crux in crossing the bergschrund, where a thick coat of rime covered a five-meter overhang of ice. The following seven pitches yielded sustained 65- to 75-degree slopes with near-vertical sections on Pitch 5. 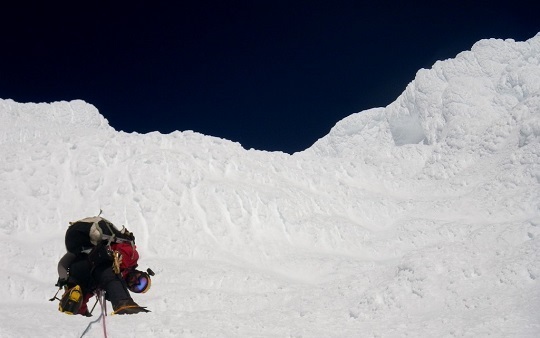 A final clamber through deep, low-angle snow brought Martinez and Rada to the summit of the peak after 20 hours of climbing. "The ice was very good for progression, but not for anchors, so the placement of ice screws was time consuming," Rada said. They descended for 10 hours to reach their camp, and named the route Suerte de Sarmiento (D+, 400m). Martinez and Rada's ascent was a byproduct of their work mapping and researching exploration heritage in the more inaccessible and isolated parts of Patagonia and fulfilled their "old dream of climbing the most emblematic mountain of Tierra del Fuego."